Cork City Council has advised business and home owners to take preventative flood measures due to heavy rain. 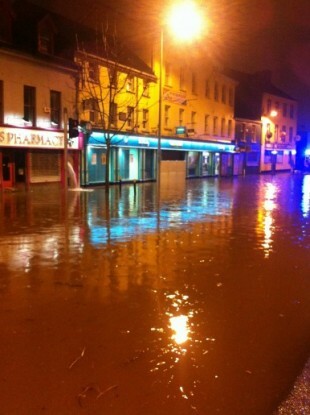 THE CITY OF Cork looks set to be hit hard by the torrential rainfall the country is currently experiencing. Cork City Council today said that high tides from 6pm today, 6.20am and 6.40pm tomorrow and 7am and 7.15pm on Sunday would put the city at risk of tidal flooding. Areas most likely to be affected, the council say, are: South Terrace, Trinity Bridge, Rutland Street, Cotter Street, Stable Lane, Union Quay, Morrison’s Quay, Proby’s Quay, French’s Quay, Crosses Green, Sharman Crawford St, Wandesford Quay, Lavitts Quay, Kyrls Street & Kyrls Quay, Coal Quay and Lapps Quay. The council has recommended businesses and homeowners in these areas take preventative measures. Met Éireann is forecasting that heavy rain will continue for the rest of today, with some heavy showers tomorrow. They have issued weather alert for the rest of the day, saying that some parts of the country will see up to 40mm of rain before midnight. Meanwhile, the AA has called on motorists to be careful, after two fatal accidents on the roads already. “Friday morning commuter traffic is normally lighter than the rest of the week but not today’ says Aoife Carragher, Head of AA Roadwatch. “In Cork a crash on the South Ring Road in very poor driving conditions resulted in extremely long delays. Similarly in Dublin city centre against the back drop of persistent rain two minor breakdowns brought traffic to a standstill. Fallen trees, overturned trucks, minor tips and any number of breakdowns have been the order of the day. “It is essential for drivers to be aware of the change in conditions as they take to the roads. Speed is unfortunately still the most common cause of collisions so motorists need to slow down and to increase braking distances. It’s much darker out there so use your dipped headlights; this will improve visibility and it will make it easier for you to be seen by other vehicles, which is equally important,” says Aoife. Email “Motorists urged to take care on wet roads as Cork issues flood warning”. Feedback on “Motorists urged to take care on wet roads as Cork issues flood warning”.